Listening devices for Audio Surveillance involve the capturing of conversations using surveillance transmitters or wireless transmitters, surveillance recorders, monitoring equipment, and listening device tools in a legal manner. Listening Devices and Audio Surveillance equipment can listen, monitor, record, and store voice conversations. Listening devices in conjunction with voice recorders can save conversations for legal evidence collection and monitor conversations while they take place. Listening Devices are designed for Audio Surveillance or Audio Intercept purposes, to be used by law enforcement agencies. The telephone is the most commonly used communications device in the home or office. Today, the threat of interception of communications on the telephone is very real and prominent, due to today's popular usefulness of the telephone and the current sophisticated and advanced surveillance market. 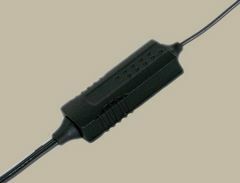 Our telephone surveillance device is the classic phone bug, a small RF transmitter which is attached to the phone line. Power supplied by the current already on the phone line. Our telephone bugging device allows phone conversations to be monitored. Incoming and outgoing calls from any landline can be listened to and recorded (with STV-05 receiver). All products are manufactured using premium quality components for ultimate reliability and performance giving distortion free, exceptional quality audio. This ultra-miniature telephone bug is very discreet and can be concealed inside a socket or even inside the telephone itself.